$12 Promotional Gift Card available on this product! 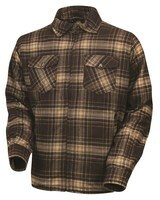 These flannel shirts offer a 100% cotton flannel shell with a full Kevlar® lining and then a quilted nylon full liner. I didn’t tear one apart to actually see the Kevlar® , but the Kevlar® liner feels like it is stitched to the shirt’s inner nylon liner. I like the nylon inner liner because it is slick and you can easily slide the shirts on over your street clothes without having your sleeves wad up inside. I personally always look for that feature when I buy flannel shirts to be worn as over-shirts. The full Kevlar® lining will add some abrasion resistance that a normal cotton shirt wouldn’t have at all. And being fully lined, it is a step beyond most over shirts like this we sell since most are only lined with Kevlar® in the shoulders and elbows. Keep in mind that an overshirt like this won’t give nearly the protection of a full-on riding jacket, but the flannel is becoming a very popular choice for many riders that just don’t want to do the riding jacket thing.